Opened in 1980 as state-supported, residential high school. Campus was site of Watts Hospital (1909-1976), built by Geo. Washington Watts. 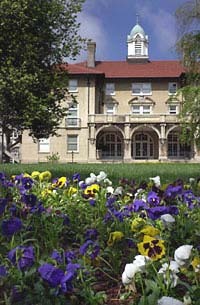 The North Carolina School of Science and Mathematics (NCSSM) was the nation’s first state-supported, residential high school for students with talents and interests in those fields. The school was a favorite project of Gov. James B. Hunt Jr. during his first term in office. Since its establishment in 1980, similar schools have been started in Louisiana, Illinois, Texas, Indiana, Mississippi, South Carolina, and Oklahoma. A total of 550 eleventh and twelfth grade students from across North Carolina are enrolled each year. The cost to the state per student is about three times the cost for a typical high school student. The school has a staff of fifty-eight, thirty-seven percent of whom have doctorates. The school is an affiliate of the University of North Carolina. Complaints were voiced during the debate over the school’s creation that it would skim the best students from the state’s schools. In recent years the institution has sought to serve those schools with in-service training for teachers and by sponsoring research and development for the classroom. 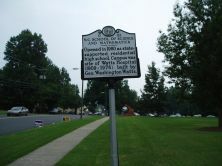 Several North Carolina cities sought the school. Durham offered the winning bid, that being the abandoned twenty-seven acre campus of Watts Hospital. Founded in 1895, the hospital, located initially at the corner of Main and Buchanan Streets, was a gift to the people of Durham from tobacco magnate George Washington Watts. The hospital was state of the art for its day, pioneering work in radiology, bacteriology, and nurses training. In 1909 Watts financed the present Spanish Mission style campus at a cost of a million dollars, with half of the money spent on buildings and half on an endowment. Watts Hospital provided care to all white citizens regardless of their ability to pay. (Lincoln Hospital was established in 1921 to serve the black population.) North Carolina Blue Cross and Blue Shield evolved out of a hospital care association established at Watts in 1929. By the 1960s Watts was overcrowded and aging. 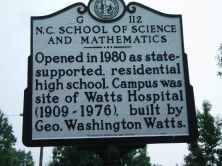 Both Watts and Lincoln closed upon the opening of Durham County General Hospital in 1976.